Sometimes recipes are inspired by other dishes you’ve eaten or recipes read. Other times recipes are inspired by a craving for certain flavors or types of cuisine. Still others come about based upon ingredients that are handy. This is one such recipe. 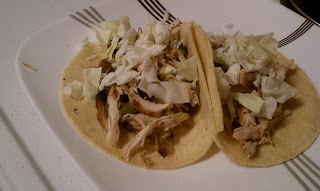 Oddly enough, I decided to make these wonderful tacos not out of a craving for Mexican food or a desire to replicate a fajita recipe. Nope. This recipe exists because I had a half a head of cabbage that I was trying to figure out what to do with. Now I can’t take all the credit because the true moment of inspiration came from my boyfriend. 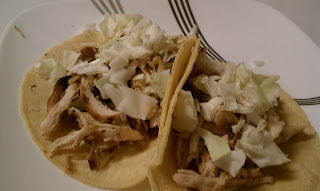 As I was contemplating the many uses for cabbage his sheer genius broke through when he said, “Cabbage tastes good in tacos.” That it does, my friend. That it does. So here we are: Fajita Tacos. This will make classic fajitas or chicken to put on top of salad. I happen to like tacos. A lot. Say no to drugs, say yes to tacos. The chicken was marinated starting the night before for maximum deliciousness. Place the chicken in a large plastic zipper bag. Use the “pour and pray” method to make the marinade, starting with equal parts of all liquid ingredients and adding more or less of desired flavors. Seal the bag and place in the refrigerator overnight. Grill the chicken, onion and peppers. Baste with excess marinade as desired. Remove from grill when chicken is cooked through and vegetables are tender. Shred the chicken and chop the vegetables. Serve in tortillas, top with cabbage. EAT! cabbage, chicken, leah charney. Bookmark the permalink. Post a comment or leave a trackback: Trackback URL.